노르웨이 설화를 듣고 사람이나 사물을 묘사하기 위한 관계절 사용법을 배워봅시다. 이번 시간에는 지혜로워지고 싶어하는 신, 오딘에 대한 노르웨이 이야기를 들어보겠습니다. 잘 듣고 사물을 묘사하기 위한 관계절 사용법을 배워봅시다. 1. 오딘은 어떤 눈을 가지고 있었나요? 3. 미미르는 어떤 샘을 가지고 있었나요? 4. 거인과 아사 신족은 서로 어떤 적이었나요? 안녕하세요? The Storytellers에 오신 것을 환영합니다. 이 방송에선 전세계의 이야기를 듣고, 영어도 배우실 수 있습니다. 저는 손보람입니다. 오늘은 ‘지혜로운 오딘’이라는 노르웨이 이야기를 준비해봤습니다. 이 이야기는 지혜를 얻고자 하는 신에 관한 이야기입니다. 이야기를 듣기 전에 여러분의 이해를 돕기 위해 몇 가지 단어를 알려드릴게요. 'Satisfied' 만족한, 'wisest' 가장 지혜로운, 'race' 종족, 'giant' 거인, 'well' 샘, 'wisdom' 지혜..입니다. 오딘이 무엇을 원하는지 그리고 무엇을 가지고 있는지, 이야기를 한번 들어볼까요? 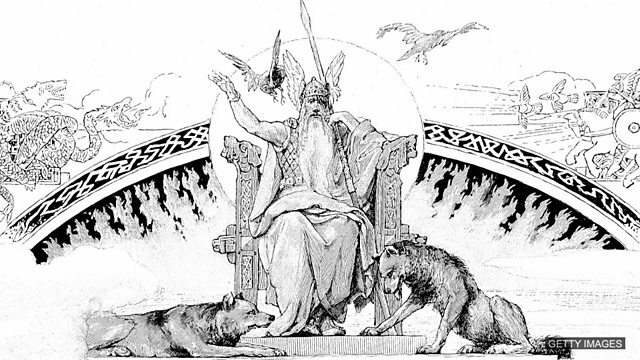 Long ago, Odin ruled as king of the Norse gods, the Aesir. He was the most powerful of all and had a pair of magic eyes which let him see everything happening everywhere. But Odin wasn't satisfied. He wanted to become the wisest person in the world. There was another race who were older than the Aesir. They were called giants. One of them was called Mimir. He had a magic well which gave wisdom when you drank from it. One day Odin went to Mimir and asked for a drink from his well. "I want wisdom," said Odin. "I can see everything, but I do not always understand. I want to know everything a person can know." 자, 잠시만요.지금까지의 이야기에서 오딘은, 세상에서 가장 지혜로운 사람이 되고 싶어합니다. 그리고 오딘은 마법의 눈을 가지고 있죠. 눈에 대해 설명하는 부분을 들으셨나요? 다시 한번 들어보겠습니다. … and had a pair of magic eyes which let him see everything happening everywhere. 'Which let him see everything happening everywhere'는 제한적 관계절이라고 부릅니다. 제한적 관계절은 어떤 사람이나 사물에 대해서 묘사하여 더 많은 정보를 알려줍니다. 이야기에서는 오딘의 눈에 대한 조금 더 자세한 설명을 들을 수 있었습니다. 마법의 눈은 오딘이 세상에서 일어나는 모든 일을 볼 수 있게 해준다고 했죠. 다른 관계절도 있었는데 혹시 들으셨나요? 다시 한번 들어봅시다. There was another race who were older than the Aesir. He had a magic well which gave wisdom. 자, 계속해서 어떤 이야기가 펼쳐지는지 들어볼까요? 도움이 될만한 단어 몇 가지를 알려드릴게요. 'Enemies' 적, 'afraid of' ~을 두려워하는, 'expensive' 값비싼, 'pain' 고통. 'gouged' 도려냈다..입니다. "But giants and Aesir are enemies that hate each other," said Mimir. "Why should I help you?" "I will pay you" said Odin. Mimir thought about this. "With this wisdom, he will become someone we giants are afraid of. The cost must be expensive and I hope he will say no." "You can drink" , said Mimir, "but you must give me one of your eyes that can see so far." "I agree," said Odin. And in great pain, he gouged out his eye and gave it to Mimir. Odin then filled a cup and drank and became the wisest person anywhere except Mimir himself. From that moment the troubles between the gods and the giants truly began. 오딘은 지혜를 얻기 위해 한쪽 눈을 내놓았습니다. The Storytellers와 함께 해 주셔서 감사합니다. 다음 주에도 또 다른 이야기와 함께 영어 배워보아요. 바이! What interesting people do you know? What interesting things are there in your town? Come and tell us in our Facebook group! 어떤 흥미로운 사람들을 알고 있나요? 어떤 흥미로운 것들이 주변에 있나요? 저희 Facebook 그룹에서 이야기를 공유해보세요! The Storytellers 다음 시간에도 세계 여러 나라의 이야기를 들으며 영어공부 해보아요.